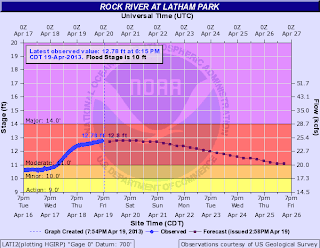 It took a while, but the Stateline has finally tapped into some warmer air. Here's the recap and look at a major cooldown for the second half of the work week. Monday was our first 70° day of the year. 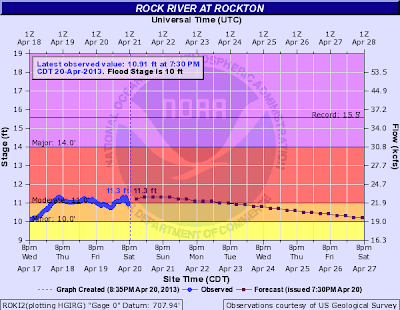 This is the second latest start to 70° weather in Rockford on record. 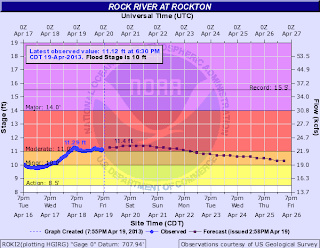 The average first 70° day of the year for Rockford is April 2nd. Tuesday was our first 80° day of the year. 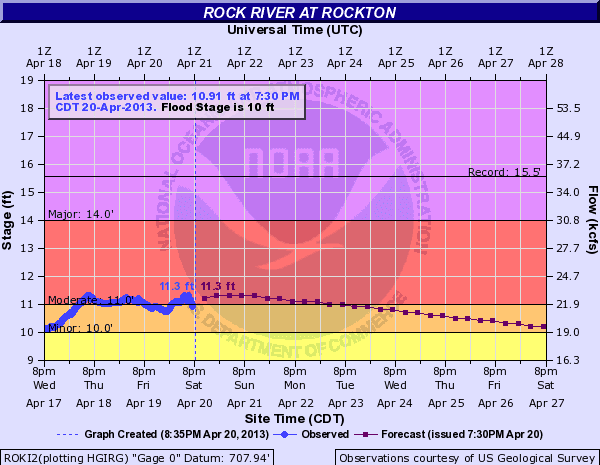 The average first 80° day of the year for Rockford is April 23rd. Unfortunately, our next storm system will drop temperatures significantly. Friday is the coldest day on the 7-day forecast, with a high of 55. That's a 32° swing from Tuesday and 13° below our normal high for early May. Temperatures Monday afternoon reached the middle 70s and this afternoon we're well on our way to the low to mid 80s! Skies will remain clear through the afternoon with a gusty south wind. There remains a slight chance for a few thunderstorms late this afternoon and evening but the greatest threat for development appears to remain west of the Mississippi River closer to the cold front. Storms will likely begin to develop around Des Moines, IA after 4pm and expand into northeast Iowa and central Wisconsin through the evening. Jetstream winds remain from southwest to northeast keeping any major storm threat out of the area - although we'll have to watch for development tonight with a strengthening low level jet. Just like last night, this could cause a few storms to move through during the overnight. Temperatures as of Noon have already reached the upper 70s and low 80s and we'll likely be close to 80° again Wednesday as the cold front begins to slow its eastward movement. The warmer weather, however, will come to an end behind the front as temperatures are expected to drop back down into the 50s by Thursday and Friday. Depending on the track of an upper level low this weekend the chilly weather may linger through Saturday and Sunday. Ever wonder what a space weather balloon looks like when it bursts high in the sky (stratosphere)? Thanks to spaceweather.com - now you know. Pretty cool! 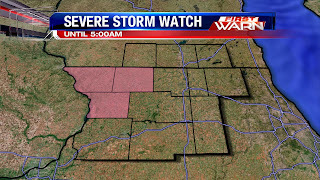 A Severe T-Storm Watch is in effect until 5:00am for the following counties: Jo Daviess, Stephenson, and Carroll. Here's a look at the radar just before 11:00pm. 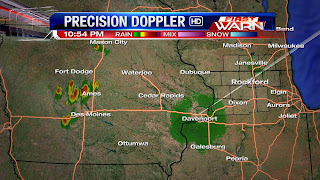 Storms were still in central Iowa and moving northeast. 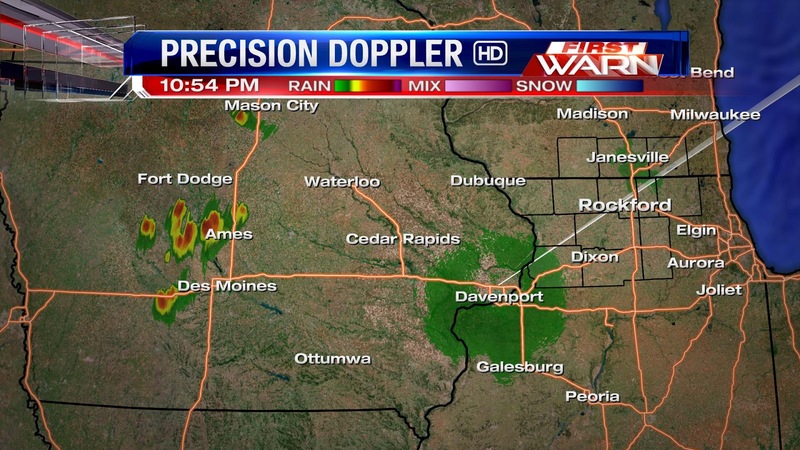 Assuming no storms will develop ahead of this activity, it will still be several hours before the Stateline sees anything. The main concern with any developing storms tonight will be hail. 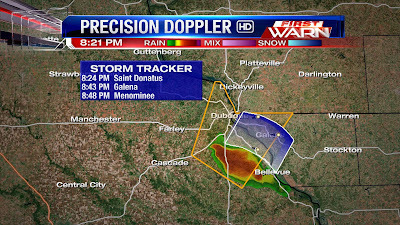 Dubuque, Iowa reported 2.5" hail with an isolated storm earlier this evening. 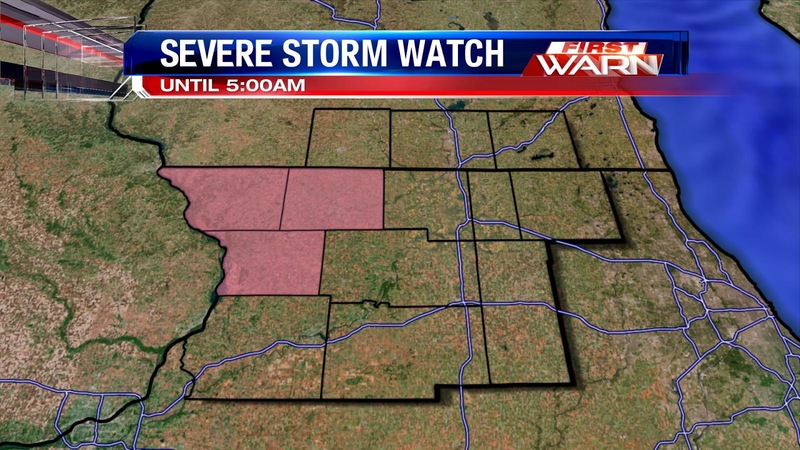 9:30pm Update: Severe T-Storm Warning for northern Jo Daviess has been canceled. 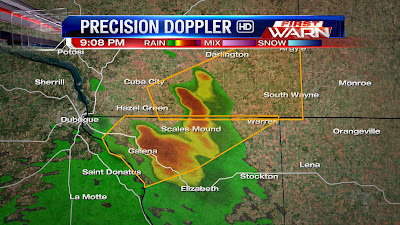 9:10pm Update: A new Severe T-Storm Warning has been issued for northern Jo Daviess County until 9:45pm. This storm is capable of tennis ball-sized hail. If you have any photos (that you can take SAFELY) or storm reports from this system, e-mail us at weather@wtvo.com. 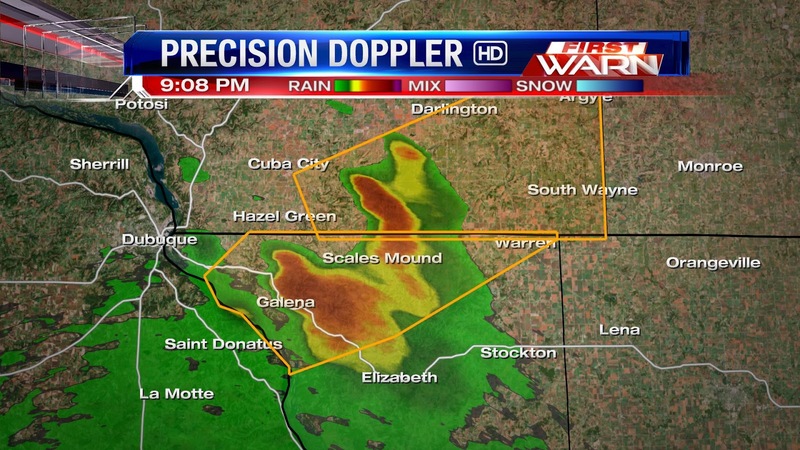 8:00pm Update: A Severe T-Storm Warning in is effect until 9:00pm for northwestern Jo Daviess County. 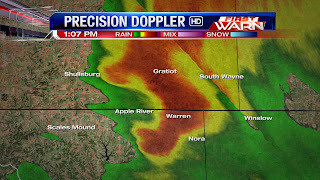 This storm is capable of quarter-sized hail and 60mph winds. The cell is only moving at 20mph, so it won't enter Jo Daviess County until around 9:30pm. Temperatures Monday afternoon will rise into the low to mid 70s as clouds increase from the west. A cold front extending from Wisconsin back through Iowa will slowly sag southeast and weaken as it does. Thunderstorms, some severe, have been developing along the southern edge of the front in Iowa between Waterloo and Dubuque and will continue to move west to east into southern Wisconsin this afternoon. Dew point temperatures remain in the low 50s with 60° dew point moisture further south. Thunderstorm coverage through the afternoon will be largely dependent upon whether or not dew points rise closer to 60° by this afternoon. There is a weak upper level disturbance moving out of Nebraska and this will be the trigger for additional storm development in southwest Iowa later today. If our dew points can recover later today severe storms will become a little more likely across northern Illinois and southern Wisconsin. If dew points remain slightly lower the severe threat will decrease. Greatest threat from any storms that do move through would be hail and wind. 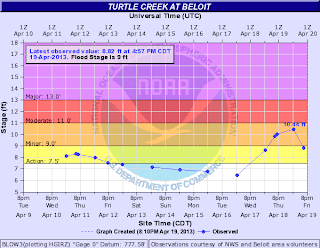 Reports of pea up to quarter sized hail have already occurred with storms that has been moving across southern Wisconsin and far northern Illinois. Once the cluster of storms moves out of the area things should remain quiet until this evening when additional storm development is possible. (2:40:48 PM) nwsbot: Local Storm Report by NWS LOT: 3 E Roscoe [Winnebago Co, IL] trained spotter reports HAIL of pea size (E0.25 INCH) at 02:38 PM CDT -- pea to dime size hail. 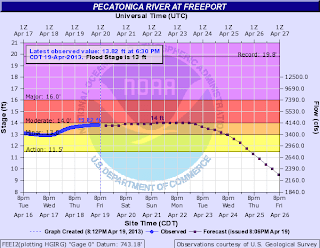 (1:57:36 PM) nwsbot: Local Storm Report by NWS MKX: 1 S Juda [Green Co, WI] law enforcement reports HAIL of pea size (E0.25 INCH) at 01:44 PM CDT -- pea size hail just south of juda. 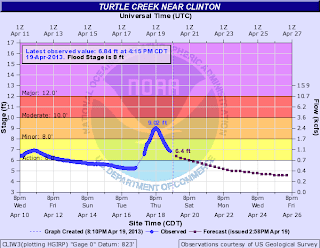 reported by green county sheriff. 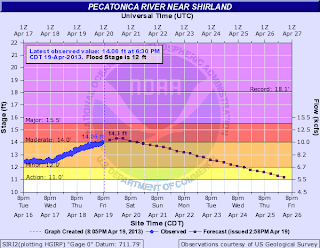 (1:42:59 PM) nwsbot: Local Storm Report by NWS DVN: Orangeville [Stephenson Co, IL] emergency mngr reports HAIL of nickel size (E0.88 INCH) at 01:29 PM CDT -- time estimated from radar. Thunderstorm currently west of Winslow and moving east around 40mph. Hail between pea and penny size likely with brief, heavy downpours. This storm will be near Winslow within the next 5 minutes, Orangeville around 1:20pm and Davis and Rock City around 1:40pm. 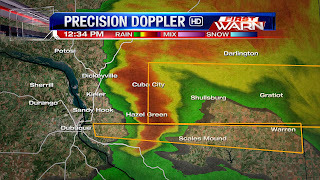 (12:51:23 PM) nwsbot: Local Storm Report by NWS DVN: Scales Mound [Jo Daviess Co, IL] public reports HAIL of half inch size (M0.50 INCH) at 12:38 PM CDT -- via social media. 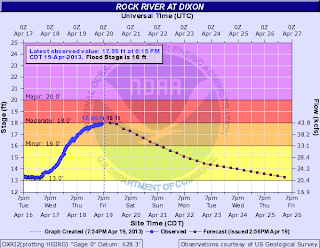 (12:39:44 PM) nwsbot: Local Storm Report by NWS DVN: 2 NW Dubuque [Dubuque Co, IA] trained spotter reports HAIL of penny size (E0.75 INCH) at 12:12 PM CDT -- 1/2 inch to 3/4 inch hail. 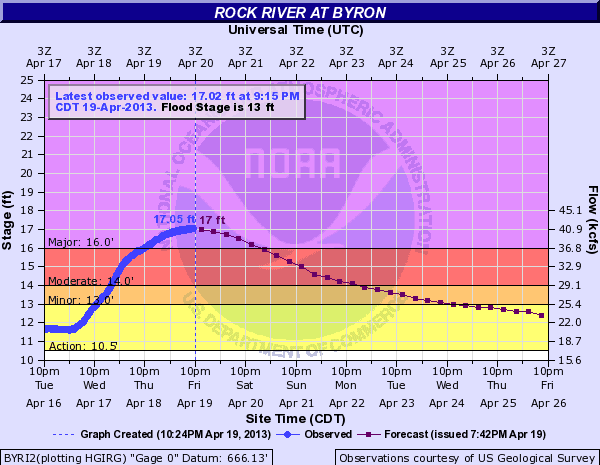 time estimated based on radar. 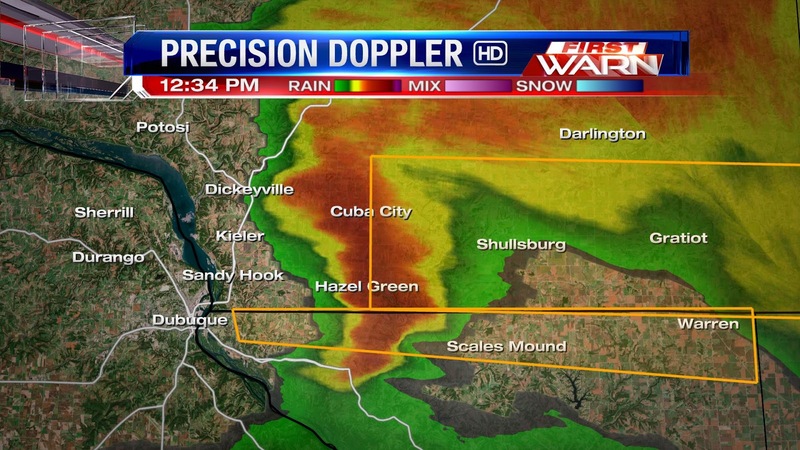 A Severe Thunderstorm Warning has been issued for northern Jo Daviess County until 1:15pm. 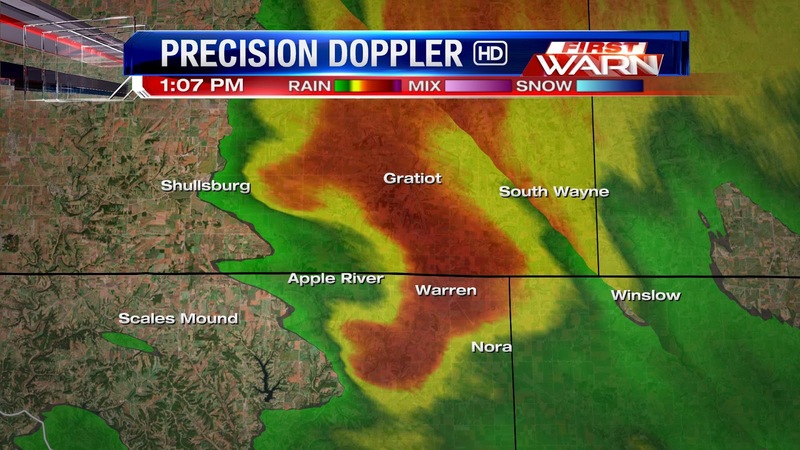 The storm is just west of Scales Mound and moving east around 35 mph. 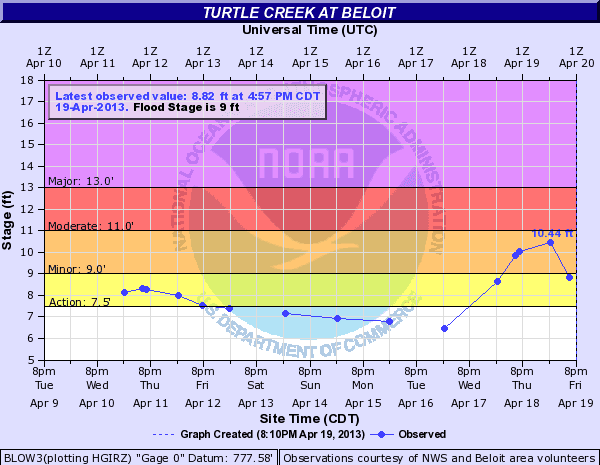 Areas affected will be Scales Mound, Apple River, Warren and Nora. If in this area you should take shelter away from windows. Reports from the storm earlier have indicated quarter to half inch size hail is possible. 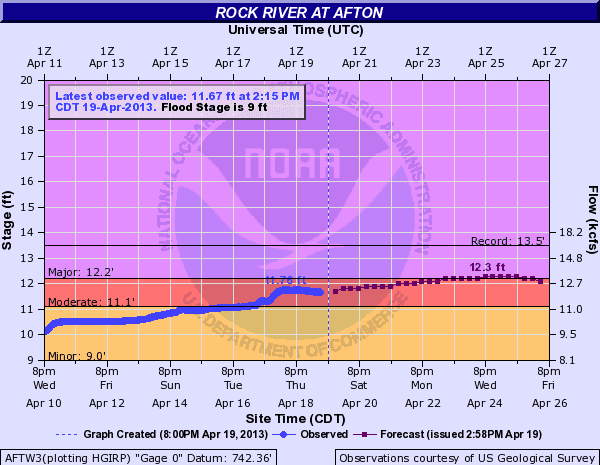 The month of April has been anything but dry and is now the 3rd wettest April on record for Rockford. 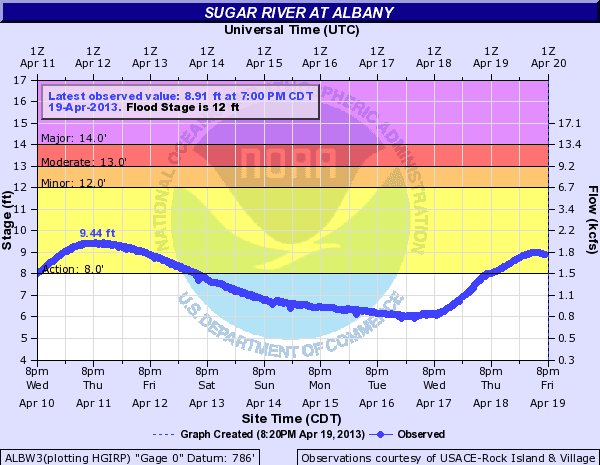 Leading the group was April 1973 where nearly 10" of rain fell. David Martin emailed me Thursday morning asking a very good question. 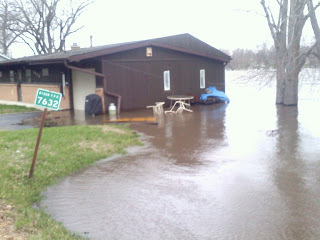 He said: "How much rainfall did we get the following months of May, June and July of the wet April years? Did any of the following months stay wet or did they dry out compared to the monthly average". Looking back the months that followed in 1973 remained above average; in fact, well above average. 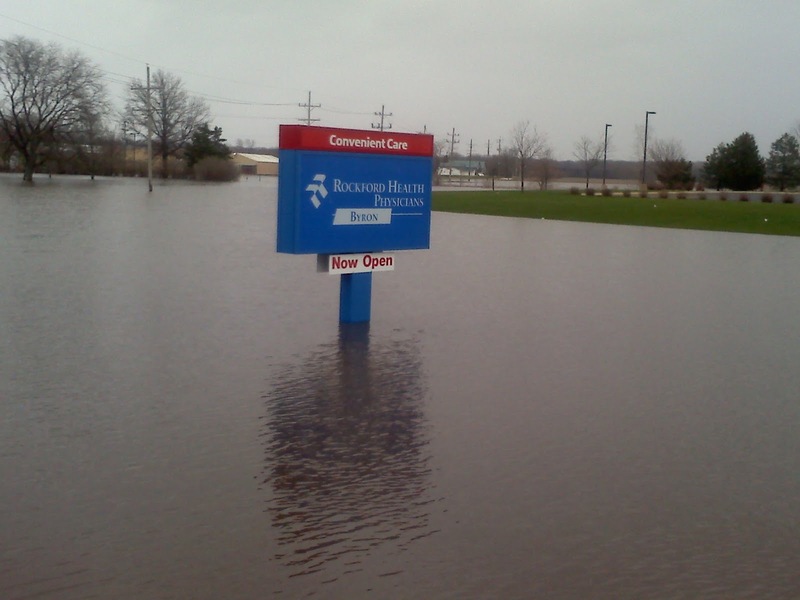 The overall spring that year received 21.43" of rain making it the wettest spring on record for Rockford. 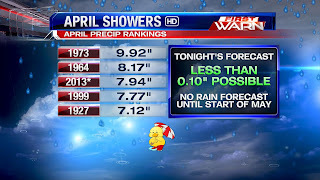 The second wettest April was 1964 when 8.17" of rain fell during the month. May that year was a little drier than normal but the precipitation ramped back up during the months of June and July. When looking at some of the other data it's likely that at least one, if not two or three, of the following months will experience above average precipitation. 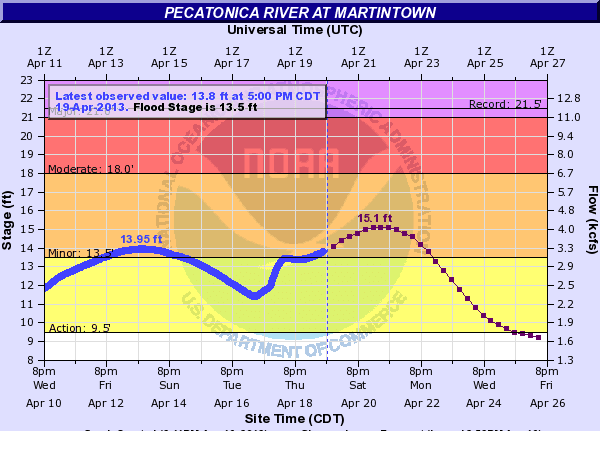 It's not likely we'll have a repeat of the drought that occurred last year, but we may continue with the cooler and slightly wetter pattern for the first couple weeks of May. Chilly Temps Tonight... But Why? Despite a big warm-up in the forecast, tonight is still going to be chilly with lows in the mid 30s. So what gives? One big reason is the cloudless skies above us. Clouds act like insulation. Under clear skies, warmer air near the ground escapes up and out into the atmosphere faster than under cloudy skies. Light winds and low dewpoints can also aid in a faster cooldown. Fortunately, temperatures warm up quite a bit after tonight. We'll be in the mid 60s for Friday and Saturday, with 70s for Sunday through Tuesday. 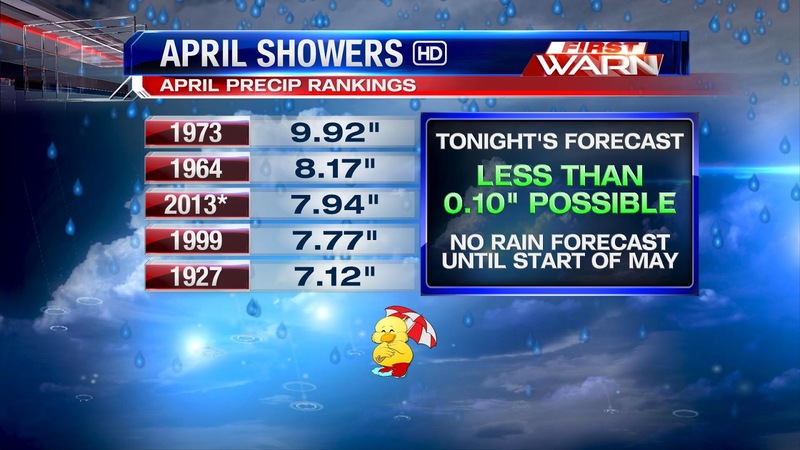 April has seen plenty of showers... in fact, too many showers. Fortunately, the forecast is looking much dryer over the next seven days. As of Wednesday, this April has been the third wettest on record for Rockford with close to eight inches of total rain. 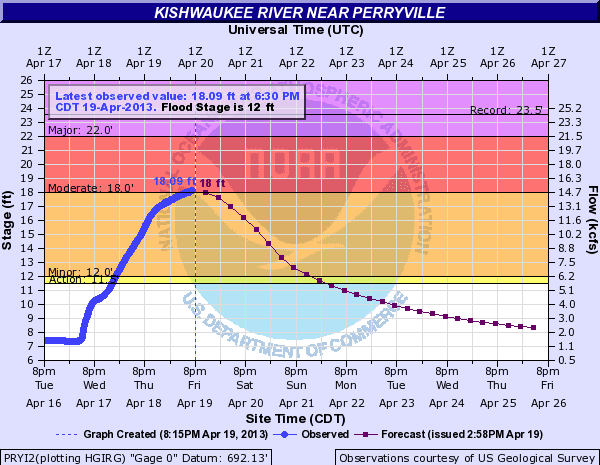 Over half of that (4.68") fell between April 17th and 18th. The forecast is calling for a light mix tonight before drying out the rest of the month, meaning there's little chance of moving any further up the list. It could be worse. 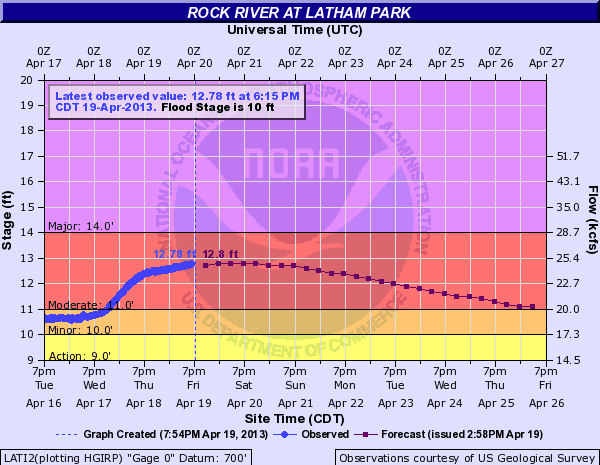 Chicago actually set the record for its wettest April, checking in at 8.54". Most of that came on April 17th and 18th, when 5.55" of rain fell. 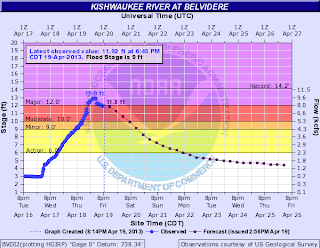 The old record for wettest April in Chicago was 8.33" in 1947. Noon Update: Heavier rain has been falling from Monroe to Brodhead down through Freeport to Forreston and Lanark this morning with nearly 0.30" falling so far. If this heavier band of rain doesn't break up and continues into the afternoon it's possible totals nearing an inch could occur. 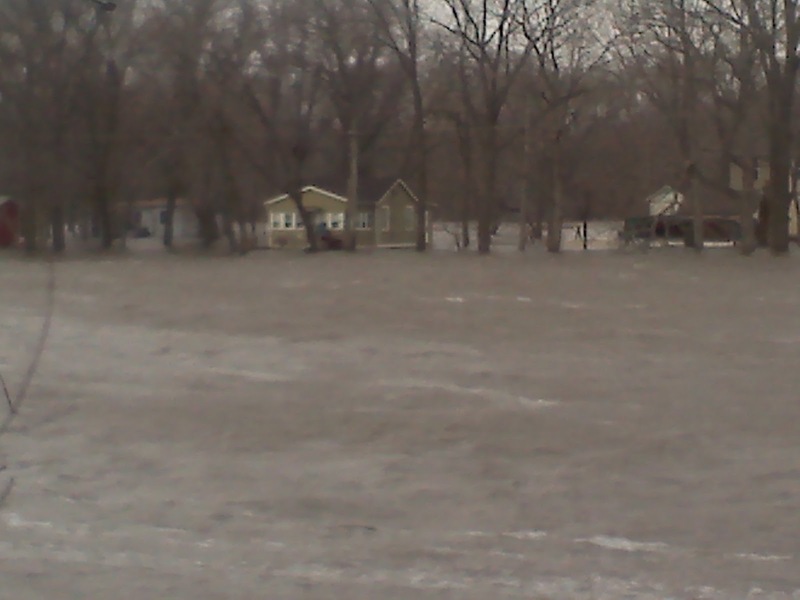 to fly from Kansas to Missouri to Iowa and may even get as to close to us as Galena, Mt. 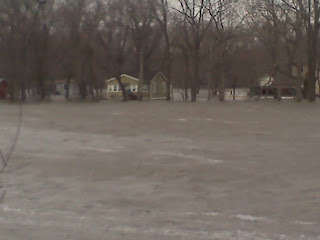 Carroll and Lanark today. The rain should be out of here by the time the sun sets but if there's any linger moisture a brief mix or change over could occur with temperatures dropping into the 30s. Temperatures the next couple of days will remain in the 50s but a warm up into the 60s is expected by this weekend. After an extremely soggy week that has led to plenty of flooding across the Stateline, more rain is in the forecast for Tuesday. It all starts after midnight tonight. An incoming cold front will bring likely showers with it. Heading into Tuesday morning, a few rumbles of thunder are even possible. Models are indicating that we'll see a short break in the rain somewhere in the late morning/midday time frame. Rain returns for the afternoon before slowly winding down through Tuesday evening. Looks like we'll see anywhere from 0.50" to 0.75" of rain with this system. 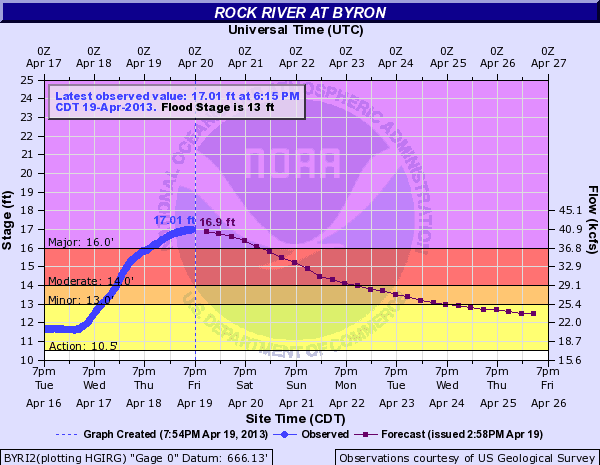 While that wouldn't add to flooding concerns, it could delay when flood waters return to normal. 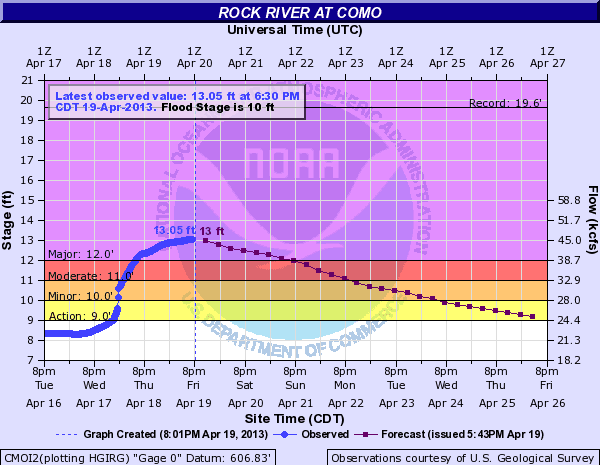 At this point, it will probably be this weekend at the earliest before waters return to below flood stage, especially along the Rock River. 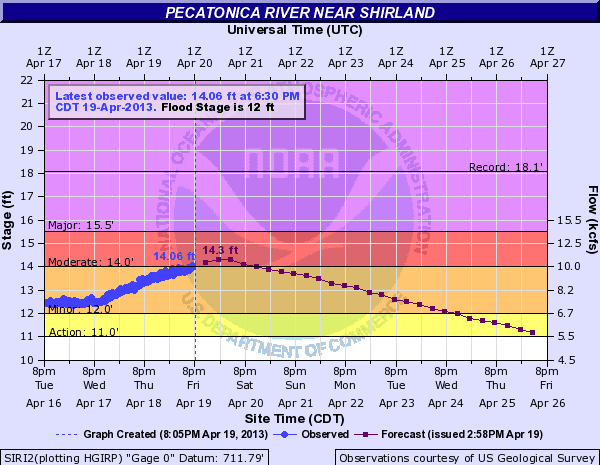 Both the Rock and Pecatonica Rivers continue to recede after cresting over the weekend. 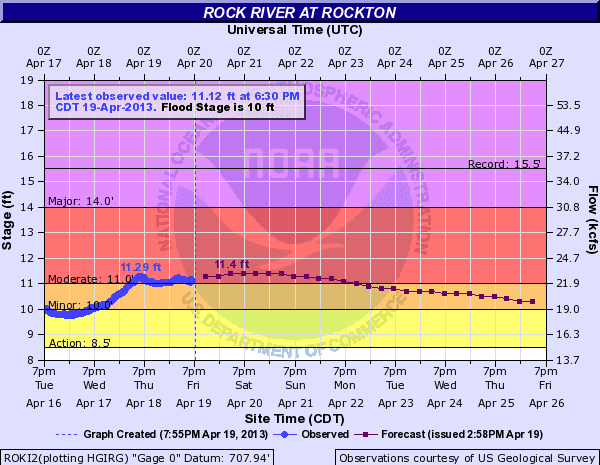 Flooding concerns will continue through the end of the week until river levels are expected to drop below flood stage. 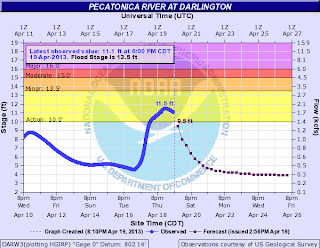 Not only has the recent rainfall had residents who live along the river on pins and needles, but it's also becoming a little concerning for area farmers. Usually by this time in April we should start to see the beginnings of what would be the planting season. In fact, corn planting usually begins around the 20th of April, depending on weather conditions, and soy bean planting within the first week of May. The nearly 3"-5" of rain that was experienced last week has had some local farmers becoming a little concerned with when they'll be able to get into the fields. 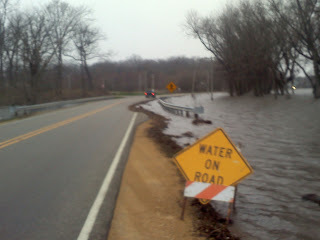 I spoke with Bruce Johnson with the Stephenson County Farm Bureau earlier Monday morning and he said according to the weekly crop report (published every Monday) throughout the state of Illinois only 1% of the corn crop had been planted and that was downstate. 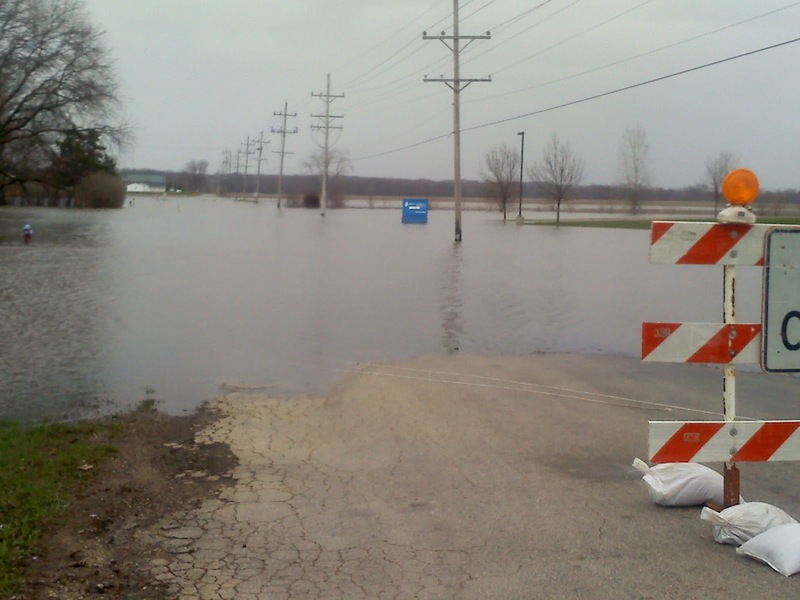 No one in northern Illinois has been able to get out in the fields due to the ground being so wet. This compared to the 38% that had been planted around this time last year. An average of the past 5 years shows that usually by this time in April 12% of the corn crop is planted with an increase during the first couple weeks of May. 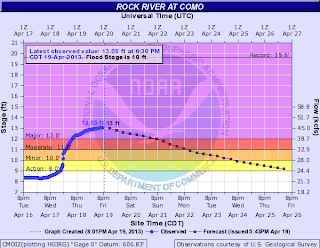 NOAA's latest reading around 7:30 PM Saturday night has the Rock River down from Moderate Flooding to Minor Flooding at 10.91 feet, a quick drop from earlier today. 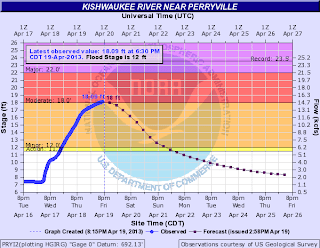 Good news for those down river waiting for the water levels to go down. Should be a dry evening, a small chance for a shower in the morning. Other than that, dry skies all the way to Monday night. 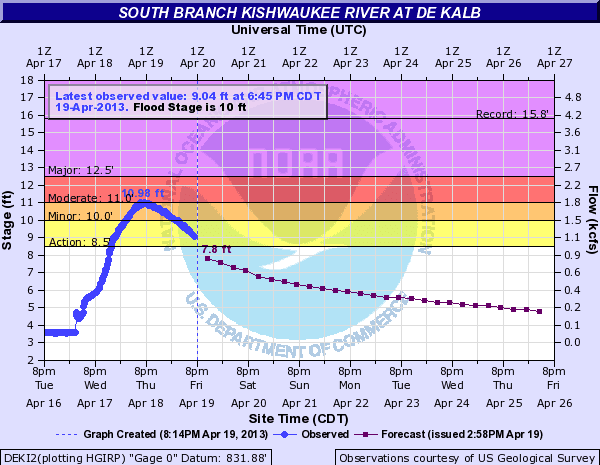 Next 48 hours will play a huge role with dropping the river levels. Full forecast after UFC on FOX 39 and 10pm on WTVO Channel 17. The Rock River at Byron is cresting Friday night at just over 17 feet, which is the highest it has ever been. 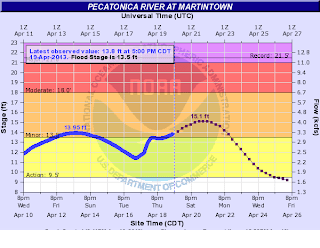 Here's a look at the river forecast. 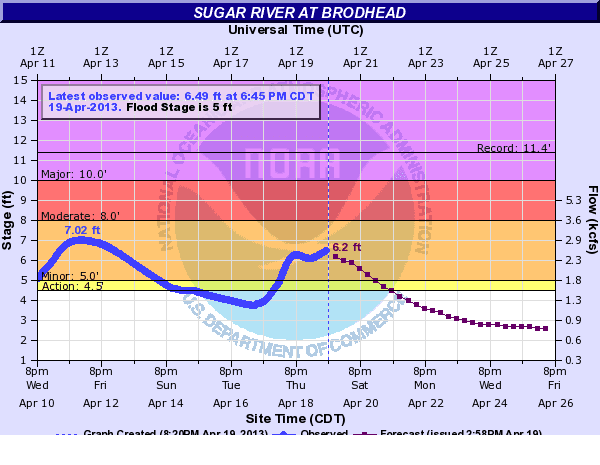 Assuming no major rain, the river will be in moderate flood by Sunday, minor flood by Tuesday, and out of flood stage by the second half of next week. 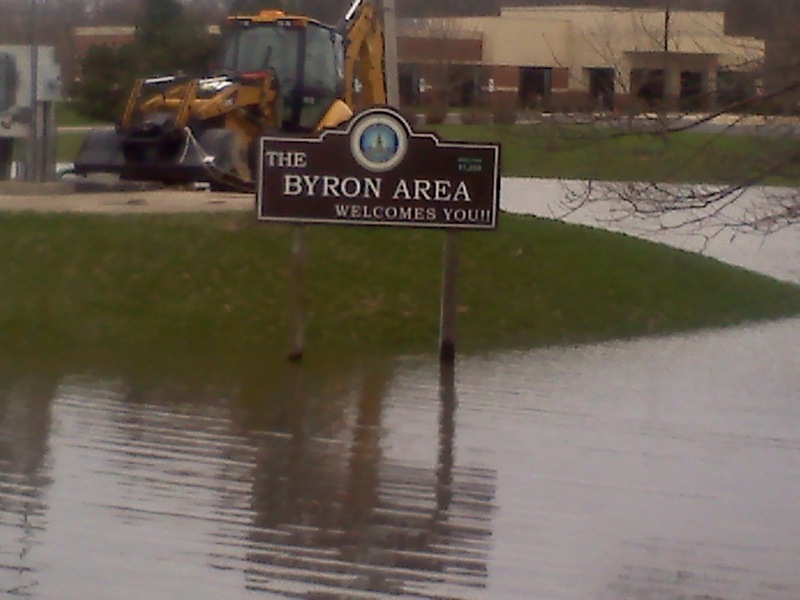 Byron could definitely use the relief. Here are some of the newest photos coming in... thanks to Claude Files for sending these in. 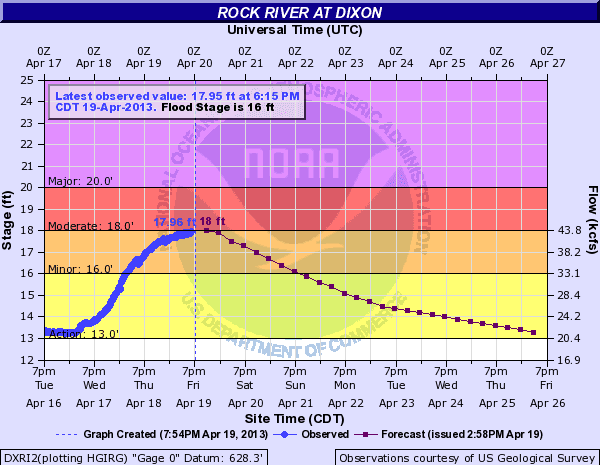 Heading into the weekend, we are expecting many local rivers to crest. Here's the latest river forecast as of 8:00pm Friday. 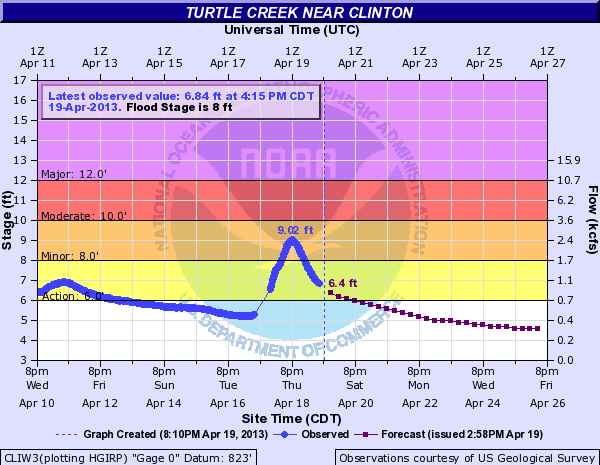 For the latest on river conditions and their crest forecasts, click here. 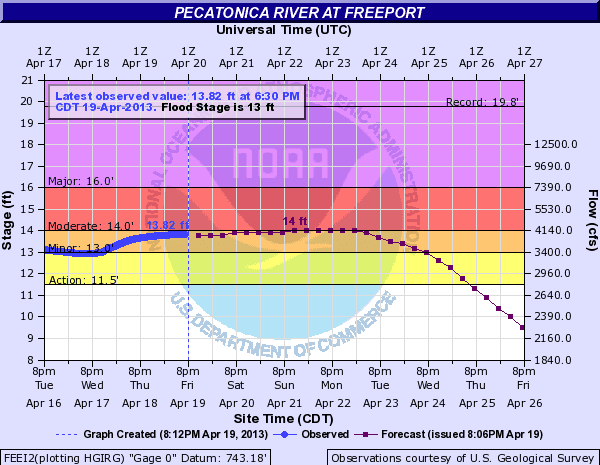 Moderate flooding (or less) is expected across the Pecatonica River this week. 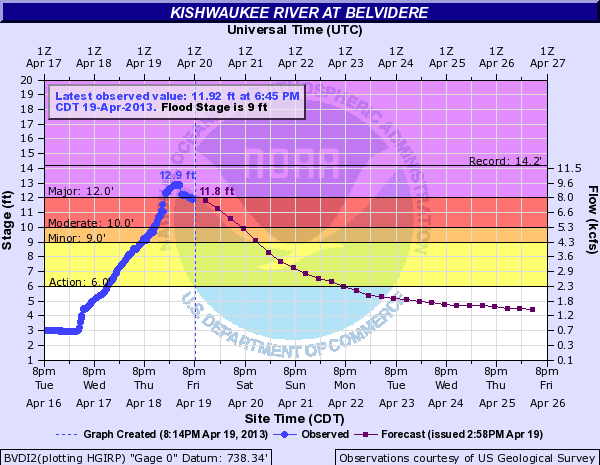 One thing to note: It looks like the Kishwaukee at Belvidere will crest about a foot short of its all-time record high level. Check the calendar...Snow on April 19th? SUNDAY 4/7: "Hi kids! I'm new."